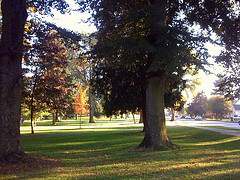 Today’s new place of the day is Lincoln-Eldridge Park in Tacoma. Until today, I hadn’t realize that the park had partially been developed by the Workers Progress Administration (WPA) and that part of the original park had been given to the Tacoma School District for the construction of the Lincoln Bowl. This entry was posted in Parks, Tacoma, WA State - Pierce County and tagged Bowl, Eldridge, Lincoln, Park, Tacoma, WPA on September 29, 2010 by admin.